Beat the altcoin market, trade on Binance and trade ZRX conveniently. No coding required. 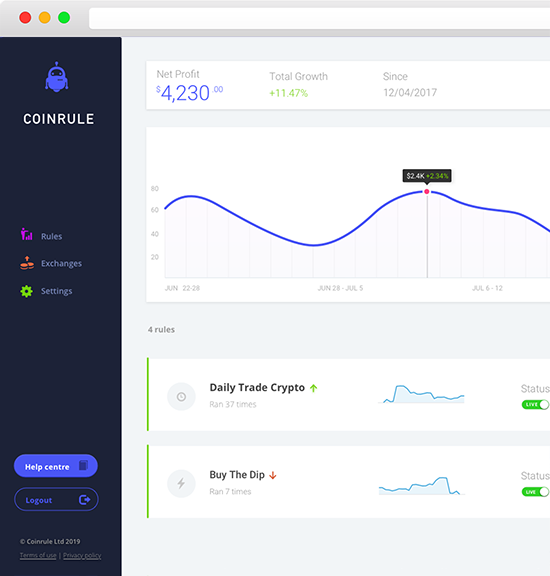 Coinrule is the effective tool for many different classs of investors and traders. There is an broad range of abilities offered on our platform. You can test and achieve your automatic strategies to build your own trading system and buy/sell ZRX. It will be very agile to accumulate ZRX, defend your portfolio, catch any pump without missing a sudden decline. Coinrule has one main aim, we want to make your crypto trading more effective while being easy. Cryptocurrency markets are open 24/7, only an automated crypto bot can fully catch any possible opportunity that will appear in the market. How to create a automatic trading rule with Coinrule? Define your automated strategies using the If-This-Then-That approach, no coding skills demanded! At Coinrule we are working a lot to deliver new components and changes to our editor every day. In fact, we are in association with our most active clients and top exchanges to gather feedback and comments. Trading needs control, attitude and method. What does make trading so arduous? The human nature and the emotions can negatively affect your trading earning. Using a automated trading system allows you to decrease the effects of anxiety, euphoria and greed that any client can experience. Also a amateur can trade like a pro with Coinrule! Receive free trading signals, createautomatic trades and manage your allocation for 30 days for free.